I’ve been thinking about quintessential marketing skills and how they’re evolving. There are certainly many more — team building, leadership, and organizational skills are universally good — but the list above serves marketers particularly well. We could debate how much of these abilities are learned skills versus how much of them are innate talent. But regardless of where someone’s starting point is, conscious effort can improve almost all of them. However, with the rapid infusion of technology in marketing — indeed, with marketing needing to deftly execute in increasingly technical environments — new skills will be needed in this branch of the org chart. Some of these have clearly been imported from engineering and IT — after all, marketing is now enmeshed in a medium that is defined by technology as much as anything — but that’s not to say that marketers must or should become programmers (although some will). 1. Analytical pattern recognition. Marketing is at the center of a data maelstrom, flooded by firehose-velocity feeds of information — web analytics, transaction histories, behavioral profiles, industry aggregates, social community feedback, etc. Wrangling the flow of that data is a good skill, as is proficiency with tools such as Excel and Google Analytics. However, the real skill to have is the ability to look beyond the numbers to see the underlying patterns and trends — to coax out explanations and ideas from the endless sea of bits. This is data analysis, but as intuitive as it is analytical. After all, pages and pages of standardized reports are increasingly useless, managerial white noise. But actionable, data-driven insights, illustrated by lucid visualizations, will be invaluable — as will the people who can deliver them. 2. Agile project management. The clockspeed of marketing is accelerating, while the granularity of its tactics is fragmenting. The luxurious days of planning a few well-contained major campaigns for the year are largely gone. Now, you’ve got hundreds — often thousands — of micro-opportunities, swirling around the extended enterprise every week, the best of which must be quickly snatched and efficiently executed. Priorities can change overnight, and near instantaneous social media feedback demands a near instantaneous response. Old school project planning can’t keep up in that environment. You need agile marketing. Agile methodologies, originally invented for rapid software development, are now being successfully adapted for use in the marketing department, such as a Scrum approach to marketing. (And, of course, it’s especially relevant when marketing needs to engage in its own software development projects.) Running an agile project well, however, is a skill in its own right — especially in an organization whose embedded culture may be, shall we say, less than agile. If you can master the art an “agile facilitator”, you can guide many initiatives to nonlinear management success. 3. Experimental curiosity and rigor. Marketing is the new laboratory. The very speed and granularity that has made it difficult to rigidly manage top-down, enables quick and inexpensive testing of new ideas from the ground up. The far majority of marketing activities at this point should be run as tests, continually trying new alternatives, pushing on the edges, constantly on the lookout for shifts in response that portend new threats or opportunities. Thriving in this marketing laboratory requires the imagination to come up with new ideas, the cleverness to figure out how to test them with minimal risk and resources, the courage to overcome status-quo-ism and actually carry out the experiments (remember, even if they don’t work, the organization can still learn something from them), and the discipline to run the tests with enough rigor to draw meaningful conclusions. Of course, since empirical data is rarely iron-clad — always lots of potential confounding variables out there in the real world — balance your confidence with the humility and open-mindedness to appreciate other factors and explanations that may reveal themselves over time. When thinking of marketing as a science, remember science is a creative endeavor. 4. Systems thinking. Marketing can no longer be managed in silos. Tactics in one area (e.g., a particular trade show presentation) impact the effectiveness of others (e.g., your search marketing ads) almost immediately. Social media has not only accelerated cross-channel effects, it’s blended and mashed-up channels and partners with independent communities into a completely new, living ecosystem. If engaged properly, that can be a powerful force multiplier; if mismanaged, it can be a train wreck. Doctor: Drinking 1 glass of wine per day will reduce your chance of a heart attack by 10%. Patient: Really? What if I drink 2 glasses per day? Doctor: Chance of heart attack will drop 20%. Patient thinks for a moment. Patient: So if I drink 10 glasses of wine per day, then I’ll be guaranteed to never die of a heart attack, right? Doctor: Correct… you’ll die of liver disease. There’s a lot of liver disease in marketing these days (figuratively speaking). As you scale up ideas in the new marketing domain, be wary of oversimplifying the “algorithm”, inadvertently generating negative side effects or getting stuck in the illusion of an unsustainable exponential curve. Systems thinking can illuminate interdependent opportunities and save you from disastrous dead ends. See, web marketing is no longer just about great content, a sweet design, and good search engine optimization. The new battleground is the web as an open, malleable, interconnected application Lego set, where your customers and partners can leverage functional components and data from yourcompany.com in conjunction with feeds and APIs from Google, Amazon.com, and their own value-add streams into a whole new kind of software. Take a look at the thousand-plus APIs available on ProgrammableWeb from not just Yahoo, YouTube, Facebook, Twitter, eBay, etc., but also The New York Times, Salesforce.com, the BBC, Zillow, FedEx, and hundreds of other companies that are locking in digital relationships through useful services and data. Somehow or another, your company should be plugging into these services, tapping and remixing them yourself, and contributing to the web-as-a-platform with your own branded stake in the ground. And although it’s rooted in technology — a very cool evolution of cloud computing — make no mistake: this is a marketing mission. You don’t necessarily need to personally know how to implement the code yourself, but you need to know enough about the uses and design patterns to make the right choices and direct the people who can implement them for you. The semantic web and semantic marketing are a part of this mashup software fluency. The original skills of marketing are still relevant, but now they must be augmented for a digital world that isn’t just a new medium. It’s a new marketing. Are you and your team ready? yep, lots of liver disease in marketing these days. good point. Of course you still need a differentiated product and a great unique selling proposition, but the job of marketing is increasingly interdisciplinary. 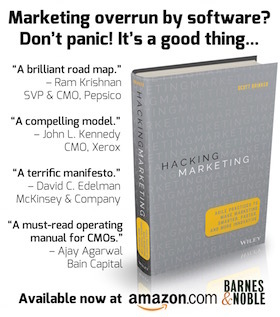 Amazing how so many marketers are resistant to the XXI Century. Do Marketing Program Managers Really Need New Skills? Scott Brinker in his recent blog post “5 new skills for the future of marketing” suggests that marketers need to acquire some additional skills. Megan Heuer from Sirius Decisions suggests something similar in her recent blog post. Do marketing program…. Interestingly, non marketers would argue that marketing skills are no different than any other skills. Being a marketer myself and now lecturing in the subject I would say that there are some generic skills but some skills are specific to this area. I’m interested in other comments to stick in my PhD. Excellent. It should really inspire some young up-and-comers…I will definitely be checking out the wining idea. Great post! Analytics is key! Marketers should learn the “marketing” capabilities of their campaign, email, CRM, web, and other tools as much as they should learn the analytics capabilities. If you’re the one with the answers, and the data to prove it, you’ll quickly become a critical resource for your company. Very interesting and Well written and Great explanation! .